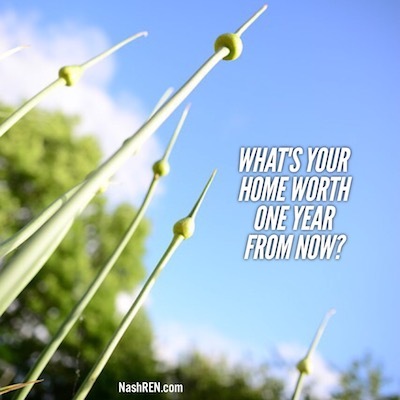 What's your home worth one year from now? Unless you know the home and understand the market, it’s difficult to place a value on your house. And that’s why many agents shy away from giving you this information. So if you want to have fun, ask them what the value is going to be one year from now and this is what you’ll get. Today, I’m going to give you something different. And, it’s based on market data and the current trends of the Nashville economy and real estate Market. For the past two years, Nashville homes have been appreciating at a rate of approximately 10% per year and Tennessee is closer to 7%. Those double digit increases cannot last forever. And that’s a good thing because it protects our downside the next time our national economy sputters. You know the old adage, the faster they rise, the harder they fall. That’s just as true for the real estate market. The cities hurt the worst during the mortgage crisis were those that had highest increases in price just before the crash. While I don’t think Nashville is going to crash, we are going to have to re-adjust our expectations for prices in the coming year. Corelogic is one of the market leaders for housing data in the real estate market. Like most of the growing metro areas across the nation, they consider Nashville to be over-valued due to the lack of inventory. Don’t let that word scare you. Corelogic predicts that we will appreciate over the coming year, just at a slower rate. They have the Tennessee pegged at 3.4% growth in price over the next twelve months. About half of the current rate. So here’s what I think will happen to Nashville. I expect our city to do better than the state because of population growth. People are coming here for jobs, lower taxes, a thriving economy and a better life. Builders of apartments, condos and homes are filling gaps in supply. Therefore, I expect Nashville to appreciate at a rate of 6-8% for the next year. It’s a sweet spot where you still get a decent return and our risk of a huge price crash is minimized. Nashville is in the right place, at the right time. And I wouldn’t want to live anywhere else. If you have questions about the real estate market, just hit reply and I’ll respond right away. [STRP UPDATE] And for those who are following Short Term Rentals, the bill to ban them was deferred again last night. This gives the committee a chance to finish their work and deliver a proposal that may work for everyone involved. That’s good news! The Daily Deal in Nashville is a brick ranch in Hendersonville on a half acre lot near the lake. The home needs updating and is listed for less than $170,000.